A game changer to decentralize marketplaces to single domain focused commerce. 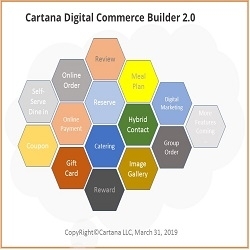 Mason, OH, April 02, 2019 --(PR.com)-- Cartana, a leading provider of digital technologies designed for SMBs, has announced the release of Cartana Digital Commerce Builder (DC Builder) for small and mid-sized businesses (SMBs) to open a digital commerce store under their single domain name. This release is available for restaurants only. Soon, DC Builder will be available for general retail stores and service companies. DC Builder is a new product following the release of more than a dozen products implemented since Cartana started in 2015. Cartana DC Builder provides the essential digital solutions that will help a SMB restaurant operator build a digital commerce responsive website within an hour without any understanding of HTML template, plugins and third-party professional help. They can turn on/off usage-based SaaS services anytime without long-term contract. Cartana provides the website hosting free of charge with a domain name assigned or they can buy their own domain name for their website. Mr. Roberto Vargas, the owner of 12 Mexican restaurants in Cincinnati area, including 4 locations of El Picante and others, recently decided to adopt Cartana technologies and turned on online ordering, loyalty and digital marketing services. Earlier, he used third party on-demand food delivery services. He said: “Their service was too expensive, 30% of the sales. Their orders often messed up our kitchen during busy dine-in times and it is not worth it.” In order to attract more digital customers, Mr. Vargas offers incentive for customers to signup their new website hosted by Castana and 10% reward for online ordering. The ordering from their new website started to come next day due to the SEO Cartana did for them in the major search engines. Founded in 2015 by Dr. John Wen, a serial entrepreneur, and two other computing veterans, with their combined 50+ years’ experience in banking, academic, defense, supply chains and retail, Cartana is a SaaS company that provides essential digital technologies to SMB operators. Cartana aims to help SMB operators to transform their business to the digital world. To learn more about Cartana, visit https://www.cartana.net or contact (513) 677-5050.